Opportunities for members to meet and network. 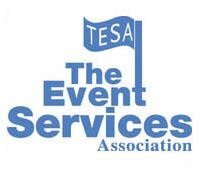 Launched in 1990, The Event Services Association (TESA) is the industry association representing suppliers, promoters and organisers in the events industry throughout the UK. TESA was established to promote the interests of organisations in the events industry and to ensure best practise is implemented throughout the industry. Information and advice is also available for businesses and individuals working in the sector. TESA provides opportunities for members to meet and network. An active tender service provides new business opportunities. Members are featured in each issue of the association’s Event Organiser magazine. The TESA website includes a wealth of information about supplier member companies. Member’s views are centrally communicated to opinion formers and Central and Local Government. Becoming a member of TESA means far more than just joining another association... Membership provides significant benefits as the association is an active organisation whose main concern is raising standards throughout the industry with the objective of improving the commercial environment for members. If you are interested in becoming a member of TESA, please contact a member of our team or visit our website where you can find and download an application form. Business & Entertainment Security Ltd.
De Boer Structures (UK) Ltd. Event & Management Services Ltd.
Robertson Taylor Insurance Brokers Ltd. The Event Medicine Company Ltd.